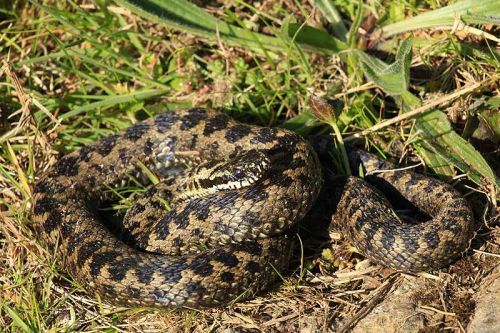 Vipera Berus - Young Adder / Warming in the early morning sunshine / Nr Porthsychan bay ( Strumble - Pen Caer ). The best time to see them is in early spring when they emerge from their hibernation dens / By mid April, the males have shed their dull winter skin and are ready to mate / There is a lot of frenzied activity on warm days, with males looking for females and occasionally wrestling with other males for supremacy / The 'dance of the adders' display / when a larger male attempts to drive off a smaller one / Following mating, females seek out a suitable place to give birth, often travelling over 1 kilometre from the hibernation site. Births take place in late August / early September / Unlike most reptiles, adders do not lay eggs / Young snakes are born about the size and shape of an earthworm, but a perfect miniature of the adult snake / Hibernation period October to March / Typical Lifespan 15 years.